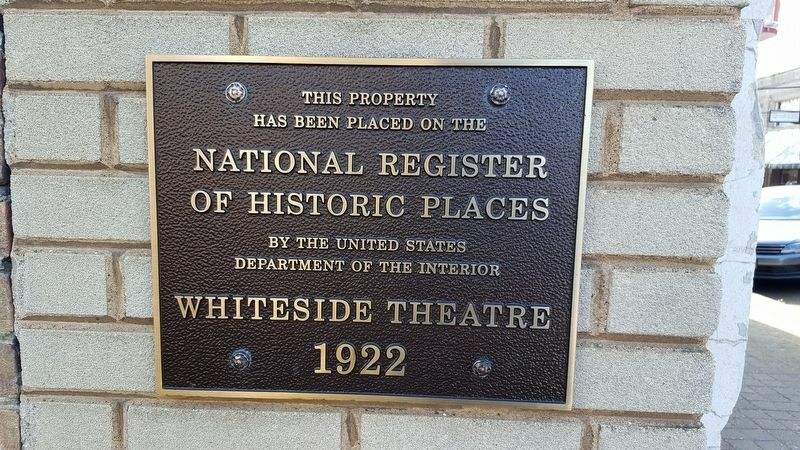 The Whiteside Theatre opened on November 9, 1922. That evening, the audience enjoyed the silent picture “The Old Homestead,” accompanied by Lilian McElroy on a $20,000 two manual, double touch Wurlitzer organ. That organ was the largest, and the Whiteside Theatre the grandest, in the state of Oregon, except for the Liberty Theater in Portland. 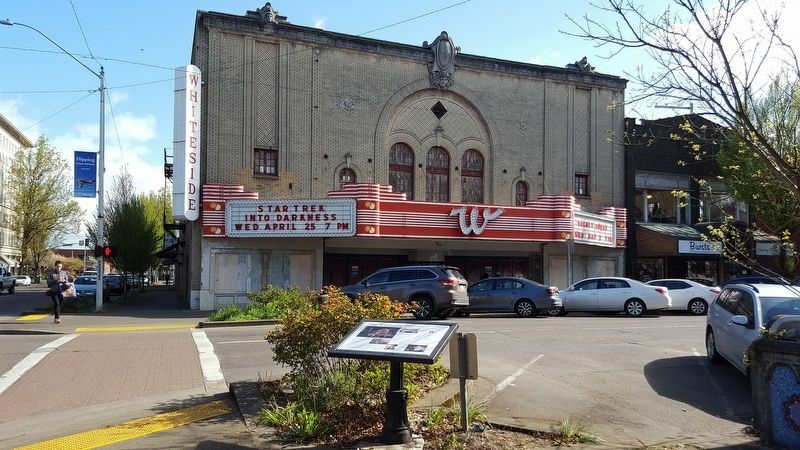 The Whiteside Theatre cost $100,000 to build and was the pride of owners Samuel and George Whiteside, brothers who pioneered the theater business in Corvallis. Their family came from Iowa to Corvallis in 1891 when the boys were teens. The brothers first operated a transfer service, followed by a grocery business and a shoe store. The brothers also operated a traveling theater tent show that visited small towns in the area. They operated Corvallis first movie house, the Palace Theater, in 1908. They went on to operate the Crystal, the Star and the Majestic before opening “Corvallis’ Finest,” the Whiteside, in 1922.
from Buxton's Central Planing Mill, both Corvallis firms. The Whiteside Theatre was decorated in the style of a grand movie palace. Heavy velour curtains bordered with silk fringe hung on the stage. The cinema screen of gold fiber material, constructed especially for the Whiteside, was “scientifically manufactured” to fit the exact distance between the screen and the projector. The foyer was richly carpeted with Wilton rugs and adorned with rose-colored velour hangings. The foyer featured decorative wall lamps, a marble drinking fountains, statues and beveled mirrors. The restroom lounges were furnished with writing stands of French wicker in blue and ivory, couches and dressing tables. The walls were paneled in orange and black, and the carpets were blue and black velvet. The restrooms had furnishings in blue and gold, upholstery in silk mohair fabric, and light fixtures with antique gold finish. The auditorium was lighted by an indirect light dome with hundreds of concealed light bulbs, featuring three circuits, dimmers and multicolored lamps. The seats were large and comfortable, including loge chairs of leather. The theater seated 635 on the main floor and 500 in the balcony. The theater was built primarily for cinema; however, live productions also were presented on stage. the interior. All 50 patrons escaped safely. Firemen from the station across the street doused the fire, but not before the building suffered $50,000 in damage. The theater was completely redone inside, including a new Wurlitzer organ, cove lighting and chandelier. The Whiteside brothers operated the Palace Theater in 1908 on Second Street between Monroe and Jackson. 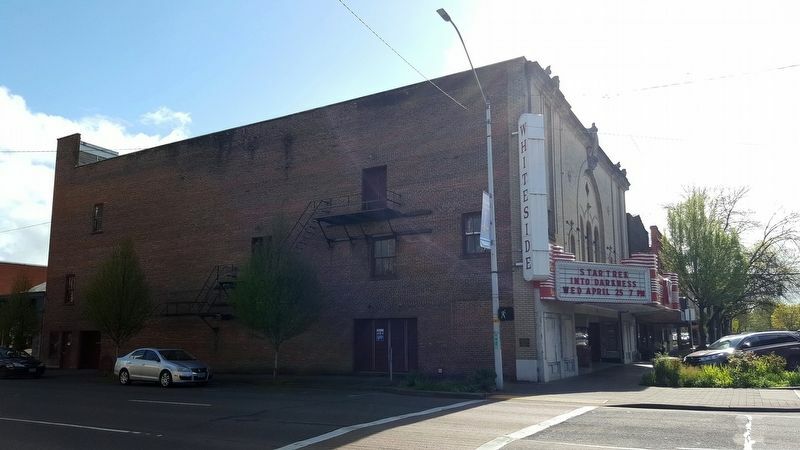 The first building erected in Corvallis for the purpose of showing movies, the Palace features an electric piano and a seating capacity of 300. Prior to building the Palace, the Whiteside brothers showed movies under a tent across the street from the Palace site. In 1909, the Weekly Gazette advertised “the Best Moving Pictures ever shown in this city, 4000 feet of the finest films direct from San Francisco.” The show was at the Opera House; admission was 10 cents. The Whitesides opened the Crystal Theatre in 1910. It was located in the Knights of Pythias building at 140 SW Second Street and featured mixed shows of film and live performances. 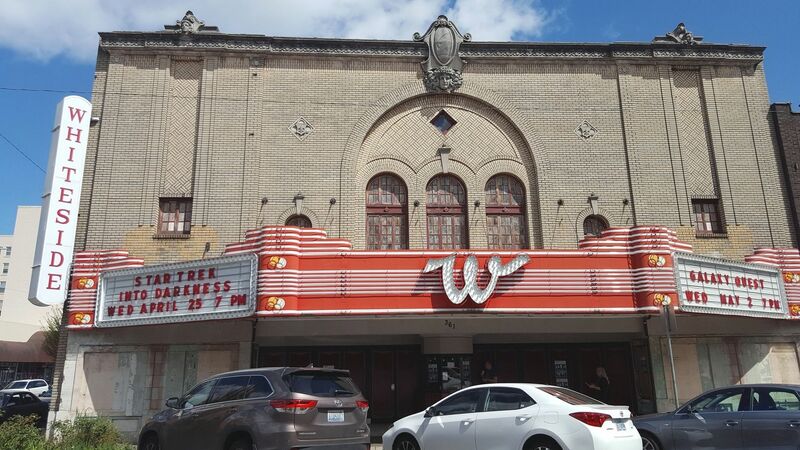 The Whiteside brothers opened their Majestic Theater on Second Street in 1913, featuring movies and live performances. A 1920 advertisement featured D.W. Griffith's “Broken Blossoms,” starring Lillian Gish, for an admission price of 30 cents. This theater was renamed the Varsity Theater in 1949. In 1987, the building was renovated for presentation of live performances and renamed the Majestic Theater. In 1916, there was an outdoor theater called the Airdome located next to an outdoor ice cream parlor at the site of the future Whiteside Theatre. It was operated by Byron Taylor. The Blue Mouse Theater opened in 1922 at 106 North Second Street, operated by Trask and Stone. The grand Whiteside Theatre, “Corvallis’ Finest,” opened in 1922 at Fourth and Madison. Plaque located on the west side of theater building. Roy, Jr. The theater was later operated for many years by the Adamson family. The Midway Theatre, the local drive-in, opened on April 19, 1949. It was located on Highway 99W between Corvallis and Albany and held 500 cars. Erected 2004 by Madison Avenue Task Force. Location. 44° 33.813′ N, 123° 15.742′ W. Marker is in Corvallis, Oregon, in Benton County. Marker is at the intersection of Pacific Hwy W (U.S. 99) and SW Madison Ave, on the right when traveling north on Pacific Hwy W. Touch for map. Marker is at or near this postal address: 361 SW Madison Ave, Corvallis, OR 97333, Corvallis OR 97333, United States of America. Touch for directions. Other nearby markers. At least 8 other markers are within walking distance of this marker. City Hall (here, next to this marker); The Opera House (a few steps from this marker); L.G. Kline Building (about 400 feet away, measured in a direct line); Benton County Courthouse (about 500 feet away); Benton County State Bank (about 600 feet away); Capitol of Territorial Oregon (approx. 0.2 miles away); Early Town Development (approx. 0.2 miles away); River Transport (approx. 0.2 miles away). Touch for a list and map of all markers in Corvallis. More about this marker. Marker is located across the street and south of the Whiteside Theatre. More. 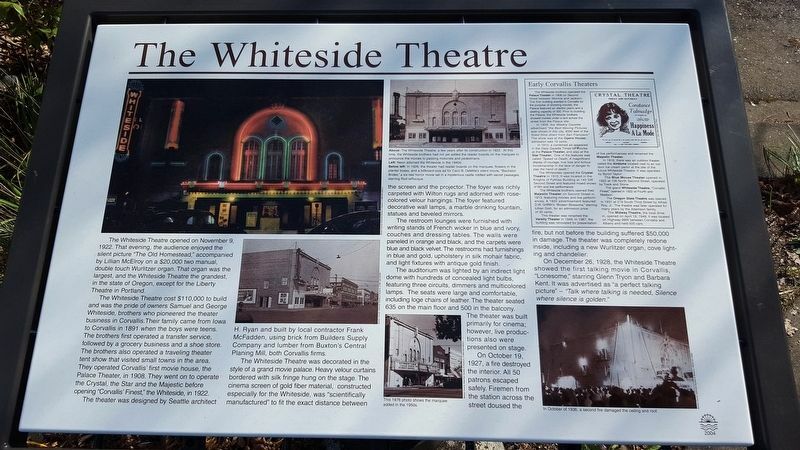 Search the internet for The Whiteside Theatre. Credits. This page was last revised on May 17, 2018. This page originally submitted on May 15, 2018, by Douglass Halvorsen of Klamath Falls, Oregon. This page has been viewed 66 times since then and 3 times this year. Photos: 1, 2, 3, 4, 5. submitted on May 15, 2018, by Douglass Halvorsen of Klamath Falls, Oregon. • Andrew Ruppenstein was the editor who published this page.